Luster Champion discs feature a pearlescent glow and special shine that give the discs a distinct look and feel. Luster discs are only available for special tournaments. Innova's Champion plastic is produced with a hi-tech material that provides outstanding performance and durability. Champion discs are distinguished by a clear or pearlescent plastic. Champion line discs retain original flight characteristics for an extended period of time. Whether used in heavily wooded situations, or on extremely rugged courses, Champion plastic will continue to perform predictably and avoid damage better than any other plastic. Originally designed for professional players, Champion discs are usually more stable than the same model in Pro, R-Pro or DX. Note: These discs are a limited production item reserved for tournaments. 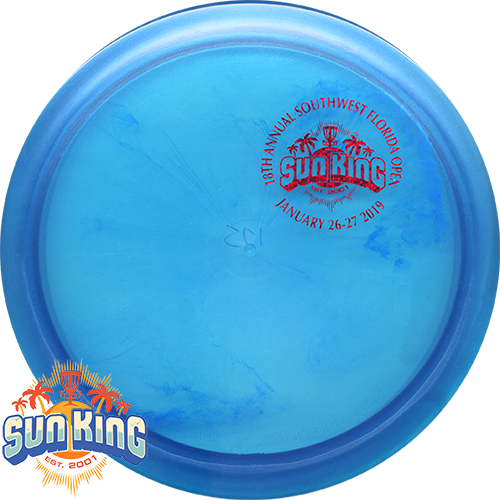 They feature the mini, NEW 2019 Sun King Logo surrounded by the 2019 Southwest Florida Open text.